For this section to make real sense, make sure you have read How Grass Gets Its Food in the post titled 3 Things You Need to Know About Grass. When Should You Mow ? You need to keep grass long enough to be able to produce the food and energy for optimum above and below ground growth. The blades can't be so tall that they lean over or mat up. This would prevent the flow of air and moisture and would encourage disease. It is how even a grass looks after mowing that makes it look good, not how tall it is. You want the grass to still be green after mowing. Cutting off too much of the leaf blade takes you down to the yellowing part of the plant that the sun hasn't greened up yet. As we noted in an earlier section, mowing is a shock to the grass plant and the more you cut off, the greater the shock. To prevent growth-stopping shock and loss of color, the general rule is do not cut off more than 1/3 of the total blade height when you mow. So, the time to mow the lawn is when it is approaches a length 1/3 higher than the desired height. For example, if you want to keep your lawn at 3”, cut when it gets to about 4 ½ inches high, not 6”. If you want to keep it at 2” then you would cut when it reached 3”. When lawns are in their quick growth periods (spring time in the North and summer in the South) their recuperative ability is high and you can get away with cutting off half the blade or more. But during periods of slow growth the recovery time is slower. Try to take off a little less than 1/3. I tell my customers to think of it as trimming the grass instead of cutting. Never cut so much off that the grass is no longer green. Homeowners have a distinct advantage over lawn mowing services when it comes to timing their mowing. They can mow as often as needed for best health, and mow as little as needed as well. Most mowing services will come once a week and during fast growth periods may be cutting half or more of the blade length at each cutting. The lawn usually survives this type of cutting, but it gets pretty long between mowings. In truth, most homeowners will only mow once a week too. How High Should I Cut my lawn ? This must be the most frequently asked question in all of lawn care. Unfortunately, there is no one answer to this question. Due to such factors as weather, specific grass types and varieties, moisture, heat, times of season and so forth there is never going to be one simple answer. My advice is to “see the lawn in front of you.” Don't just mechanically follow a chart. You are dealing with a living system that changes with its environment. Having said that, here is a chart that will give some general guidelines for the mowing heights of various grass types. There are a few grass types that can be maintained at both high and very short heights. For example, Bermuda can be used for home lawns as well as putting greens. When maintained at lower heights you need to compensate with more fertilizer to stimulate more food production from the small amount of leaf blade area that you do have. As you can see from the chart, there are only a few grass types that can tolerate very short mowing -say an inch high or less. If you have a grass type that thrives at a 3-4 inch height, but you are constantly mowing around 1 ½ -2” high, eventually your main grass disappears and other grasses take over. I can't tell you the number of times I've been called out to look at what a homeowner thought was still their original bluegrass lawn, only to find that there was no sign of bluegrass. The lawn had turned into a fine fescue or a bentgrass lawn because they kept mowing too short. A Bad Idea – Some homeowners, as well as some lawn mowing service operators, have the idea that if they mow the grass short they will have to do less mowing. Short mowing actually stimulates more growth intitially. The grass stops all rooting and other health functions in order to send energy back up to the shoots to recover the vital leaf blades. Eventually,however, with continued short mowing the grass gets too weak to grow and dies out, being replace by weeds and other, usually less desirable grass types. Our advice is to favor higher mowing heights when you have a choice to make. By the way, it is true that you can reduce the percentage of weeds on a lawn to some degree by having a taller or a thick grass. Cooler soil, less sunlight reaching the ground and less space for the weeds to grow all contribute to less weeds. In the next section, All About Mowing Part 3, we'll teach you how to mow like a pro, and talk about adjusting mowing height by season, grass clippings, the difference between Northern and Southern mowing. Then you'll get a step-by-step guide on how to actually do the actual mowing of the lawn. 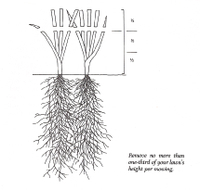 Nature's Biological Dethatcher digests Thatch using decomposition bacteria and enzymes. Late Fall Winterizer-Why, When and How.